GIANTS members can enjoy Event Cinemas just like GIANTS players Toby Greene, Zac Williams, Phil Davis, Jeremy Cameron and Heath Shaw. 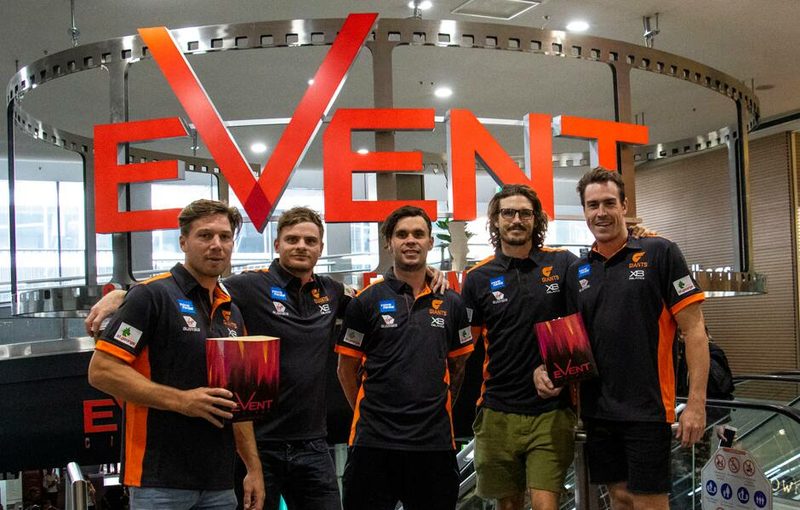 The GIANTS are proud to announce a new partnership with Event Cinemas that will help our members and fans enjoy more entertainment options than ever before. With a number of locations across Western Sydney, Event Cinemas is the perfect entertainment destination for families across the cooler winter months. The GIANTS playing group experienced the Event Cinemas at Burwood with the staff happily accommodating the players for a private screening of Free Solo - a sports documentary with plenty of key takeaways that are relevant to what the team is trying to achieve in 2019. As always, Event Cinemas has all the biggest stars on screen in the coming months that will entertain the whole family. Whether you prefer comedy, drama, action or animation - there’s something for everyone at Event Cinemas. To celebrate the partnership, GIANTS members are able to redeem a movie ticket and small popcorn for just $15*. Step 4 – An option for ‘GIANTS NSW Popcorn Package’ will appear. Select this option and follow the prompts to complete your purchase. *Valid at Event Cinemas Bondi, Burwood, Castle Hill, Campbelltown, Liverpool, George St, Glendale, Hornsby, Hurstville, Kotara, Macquarie, Miranda, Parramatta, Top Ryde, Tuggerah, and GU Filmhouse Beverly Hills & Cronulla and Greater Union Shellharbour and Wollongong only. Offer is valid for up to 4 tickets at $15 each. 3D and VMAX surcharges apply. 3D glasses $1 extra if required. Not valid in Gold Class. Not valid for special events, alternate content, Movie Marathons, public holidays, Chicks at the Flicks or with any other offer. Online booking fees apply. Valid for current Cinebuzz members only. Offer expires 30 June 2019. Not valid for Avengers: Endgame tickets from 24.04.2019 - 01.05.2019. Not valid for premium seating concepts or boutique cinemas.